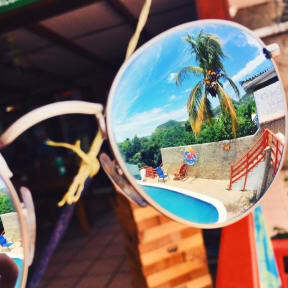 Hola Ola is a traveler-owned and traveler-inspired hostel located in the idyllic and booming beach town of San Juan del Sur, Nicaragua. 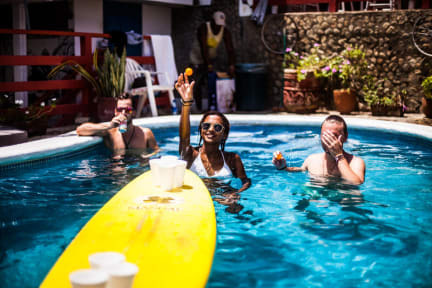 At Hola Ola, we have the simple yet powerful mission of connecting great people with each other, great experiences, San Juan del Sur, and Nicaragua. We’re not simply a place to stay — the positive impact that a hostel can and should have on its guests is at the heart of everything we do. We’re a spacious 30-bed hostel with equal affinity for both beach barbecue parties and live music nights. Hola Ola’s balance between fun and tranquility makes it the ideal atmosphere for whatever you’re looking to do. Hola Ola is located a breezy 10 minutes beach-walk from the heart of town — close enough that everything that San Juan has to offer is at your fingertips, yet far enough to escape the noise of the town if you’d like. No Credit Card payment for rooms.